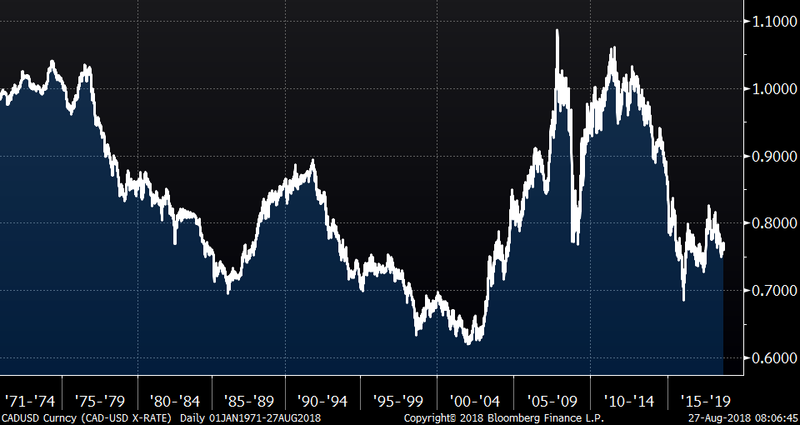 I last looked at this topic back on April 30 and I thought with all the talk about the strong U.S. dollar and what I would classify as misinformation that I have heard in recent weeks, I thought I should update you with my thoughts on the subject. Recall that I noted the importance of currency returns when investing globally. For Canadians, we are a little over three per cent of the world equity capitalization (based on the Canadian dollar's weight in the Vanguard VT Total World ETF) and about three per cent of the world’s debt capitalization according to the most recent numbers I calculated (based on the AGGG World Bond ETF trading in London). These are not perfect measures, but it illustrates that Canada is very small and therefore currency risk is very large for Canadian investors. In that light, I calculated the annualized change in the value of foreign currencies in Canadian dollar terms since the world started to float currencies after the Bretton Woods system (which was in effect 1944-1971). So, depending on where we look, currency is a significant majority of the annualized return or about half of it. When it comes to market returns in strong developed countries like Germany, currencies will tend to neutralize in the long run. The example below shows the price returns (not including dividends) of the German DAX versus the S&P 500 return. The middle graph shows the percentage of out-performance and under-performance over time. The returns have basically been the same. But over the years (sometimes a decade or more), there is a dramatic difference in performance. The lower graph shows the currency impact in terms of the euro (using a synthetic euro prior to 1999). Currency is responsible for the majority of your return as a global investor. One main reason for this is that net revenues to the company are after foreign exchange repatriation. So if sales are up 10 per cent in a given year for a Canadian company selling to a U.S. customer and the currency changes 10 per cent over a year, there is zero net growth in revenue to the company and likely expenses have risen commensurate with inflation rates. On the opposite side, weakness in the domestic currency adds to net FX-adjusted revenues and can multiply the returns. Currencies have a major impact on corporate earnings. We will start to see the strong U.S. dollar have a negative impact on earnings growth in 2019. It may offset most of the positive we saw in 2018. This has been a big factor over the past few years while the euro has been weakening. The Fed has been raising rates, but the European Central Banls has not. The bottom line is that currencies are the biggest markets in the world and relative interest rates are very important to capital flows, as are trade deals. Everything U.S. President Donald Trump is doing is likely to be offset by a somewhat stronger U.S. dollar over time. ETFs are the only way most investors can take a currency opinion when investing. There is a cost to hedging, it is not free. Generally, the cost is the interest rate differential between the two currencies plus a spread (profit) for making the trade. 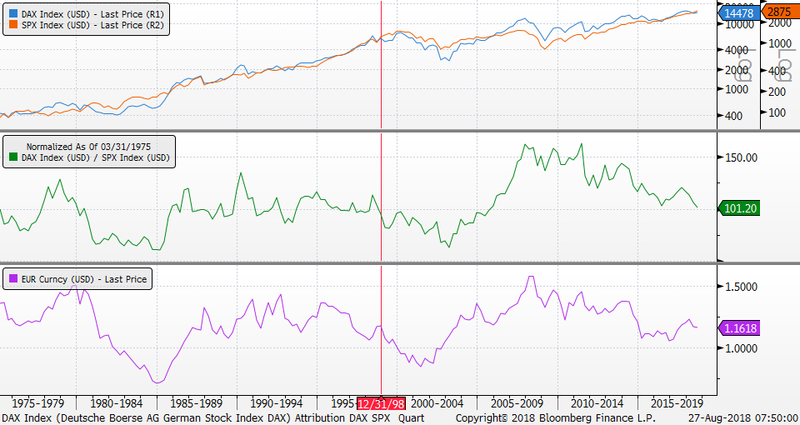 In most developed markets where interest rates are similar in the long run, the costs are relatively low... especially when compared to the cost of being on the wrong side of a trend for a few years.